While in Manila 4-6 August, German deputy foreign minister Werner Hoyer had a first hand view of the reforms being enacted by the government of liberal President Benigno "Noynoy" Aquino. "We should continue to strengthen the exchange between Europe and South East Asia," Hoyer said. "That includes stronger economic ties and promoting free trade." He felt that the region had gained in economic importance for European companies, but that it also gained in political strength. 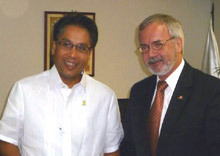 Werner Hoyer, who was president of the European Liberal Party (ELDR) from 2000-2005, met with Transport Secretary Mar Roxas, the current president of the Liberal Party of the Philippines. They discussed questions of trade and economy. He also met with Justice Secretary Leila de Lima to talk about human rights issues and a German-sponsored project for legal reform, and discussed German and European relations with the Philippines, the peace process in Mindanao and regional developments with Foreign Secretary Albert del Rosario. "It is so important that the German deputy foreign minister came to support the reforms of the Philippine government, and to urge them to continue along this path." said FNF Philippines Country Director Jules Maaten. It was Werner Hoyer's first visit as Minister of State at the Federal Foreign Office to South East Asia. After Manila he went on the visit Indonesia, Malaysia and Singapore.